TIM LINLEY had a dream return to Sussex as he picked up five wickets on the opening day of their County Championship clash with Durham at Arundel. Linley, who joined Sussex from Surrey on loan earlier this week, secured his first five-wicket haul since 2012. He ended the innings with figures of 5-63 from 19 overs as Durham were dimissed for 301 just after tea on day one. After winning the toss and deciding to bowl first, Sussex made an early breakthrough as Steve Magoffin clean bowled Keaton Jennings for five. Durham fought back well from that point, though, with Mark Stoneman and Scott Borthwick (24) putting on a quickfire 69 for the second wicket. However, Linley’s introduction into the attack saw a change in fortune for Sussex. He dismissed Borthwick (24), Stoneman (51) and Paul Collingwood (nine) in quick succession as Durham went from 80-1 to 96-4. Linley took three wickets before lunch and then claimed two more in the afternoon session to clinch a five-wicket haul. He dismissed Ryan Pringle for five and Paul Coughlin for nought in the space of three deliveries. Durham were looking good after the lunch interval, with Gordon Muchall and Michael Richardson both going well. Richardson fell for 46 after he shelled one straight to Chris Nash and that broke his and Muchall’s 83-run partnership. Sussex were then frustrated in the early parts of the final session as Gordon Muchall and Chris Rushworth (39) put on 63 for the ninth wicket. Rushworth was eventually dismissed by Luke Wells after he top-edged one straight to substitute fielder Chris Liddle. 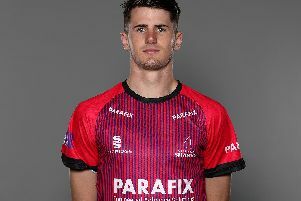 Muchall continued to thwart Sussex but he was stranded on 81 from 214 balls when Graham Onions hauled out to Chris Nash for one. Luke Wells ended the innings with career-best figures of 3-35, while Magoffin picked up two wickets but went for 84 in his 19 overs. Sussex got off to a solid start in response as Mike Yardy and Luke Wells put on 28 for the first wicket. However, a rush of blood from Yardy saw him leave a straight one and he was clean bowled by Rushworth for 20. Wells then went for 13 after he nicked one on to his stumps to give Rushworth his second wicket of the day. Matt Machan (11 not out) and Ed Joyce (nought not out) saw out day one for Sussex as they closed on 44-2 and they trail Durham by 257 runs.